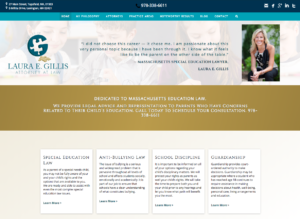 Gillis Law has an extremely targeted and narrow prospect audience. They were pleased with the overall look and feel of their website but needed a retouch to enhance their prospects’ first impression. Their old site lacked clear information on how to book a consultation and on the services they offered. 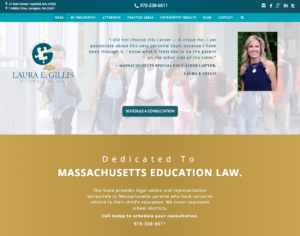 We were able to touch up their existing site using the current color schemes and general layout. Our designer enhanced the layout to improve a client’s first impression of the firm, adding a button front and center on the page making it easy to book an appointment. We focused on designing a renewed layout with enriched imagery to help improve the conversion rate (booking appointments and phone calls) from paid ads leading to the website. The content on the landing page concentrates on who they are, what services the firm provides, and how to schedule a consult. This approach proved profitable, increasing conversions substantially.